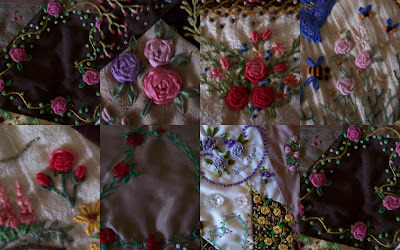 Here are just some of the roses I have done on my Crazy blocks from my Crazy quilt, "My life so far"
Can you tell I am mad for roses? My favourite is blue moon, but alas mine died, so will have to replace it one day. I have done a whole block dedicated to roses. I will put a picture up soon of that one. I love doing the bullion stitch and was shown a wonderful way of doing it at a workshop put on by my quilt group and taught by a lady called Cathy Sotiriou. Also shown here is a chain stitch rose, cast on stitch rose (blue moon) and silk ribbon (woven ribbon rose). It seems there are so many different stitches around to do roses and I look forward to experimenting with some more. Check out the little bees, they were done in the bullion workshop with Cathy also. 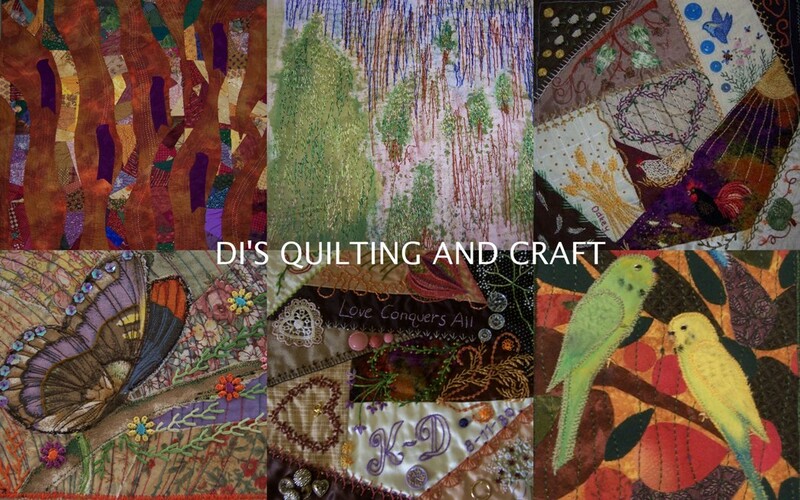 I really admire the time and patience that goes into making a crazy quilt. So beautiful. Love roses too. We used to have dozens of bushes once upon a time. My husband loves Peace. I am partial to Mr. Lincoln for the scent, gorgeous red, and long stem. Your love of roses is definitely reflected in your quilt. Your bullions are so good...and the ribbon roses too. This quilt is going to be a wonderful heirloom.